Part 3 of my Disney Analysis. Despite my love for Disney films, I acknowledge that not all of them are, well, good. But after working on the last two posts, I wondered what effect those characteristics have on how well a movie is rated. Do critics share Disney’s sense of justice and just want to see those villains die? Do audiences actually prefer movies with male protagonists, as much of Hollywood seems to believe? 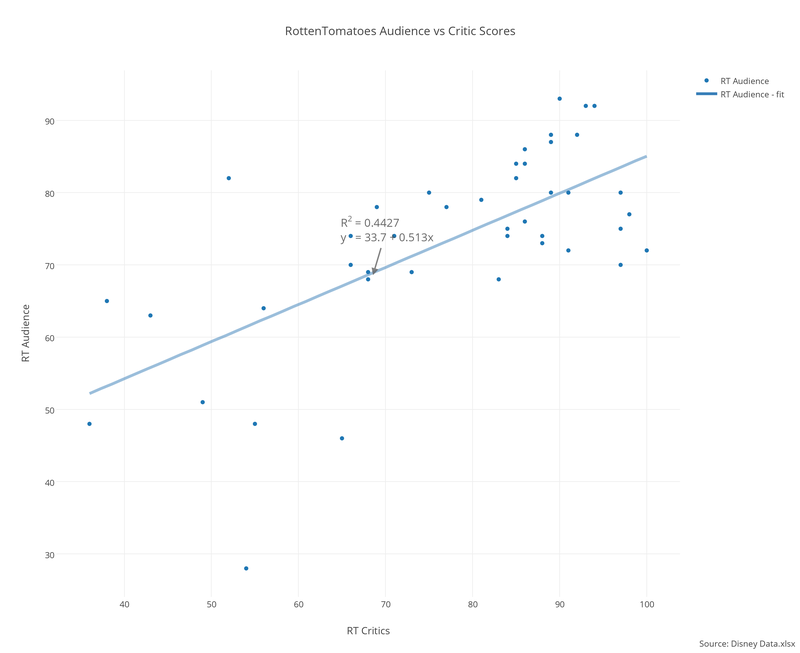 To find out, I collected the tomatometer scores of all of the movies from my list on RottenTomatoes.com – both the critic score and the audience score as, though there is a correlation between the two, it’s a moderately weak one. I mostly included this because I wanted a graph that wasn’t a box plot. So first, let’s look at the fates of the villains vs how they scored. I create two plots: one for the critical scores and one for the audience scores. 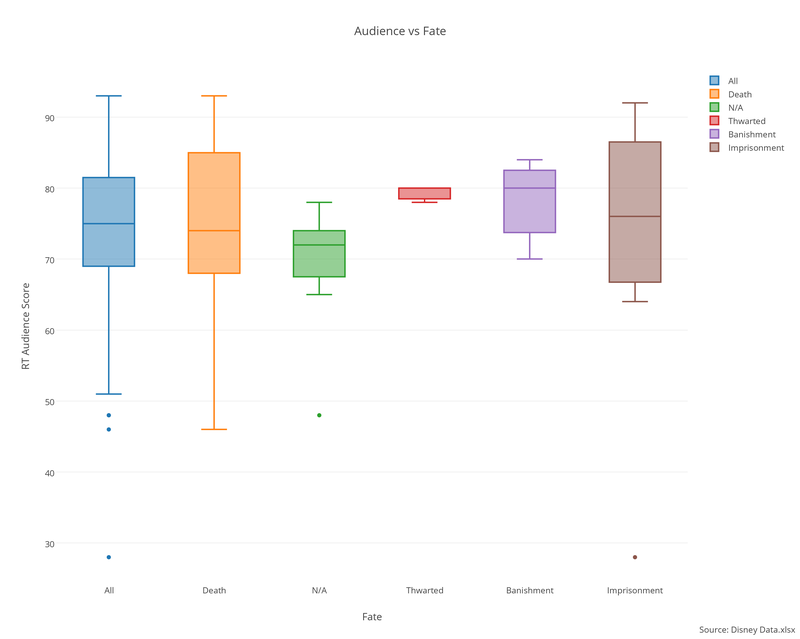 From these I can conclude…that there’s not much connection between the fate of the villain and how audiences react. We can say that there is a slight audience preference for movies that actually have a concrete antagonist, and we may also be able to say that critics and villains have a slight preference for movies where the antagonist is merely thwarted, but it’s not a strong connection. What about gender, though? How much does that have an effect? Let’s look at villain gender first. And as for the protagonists? 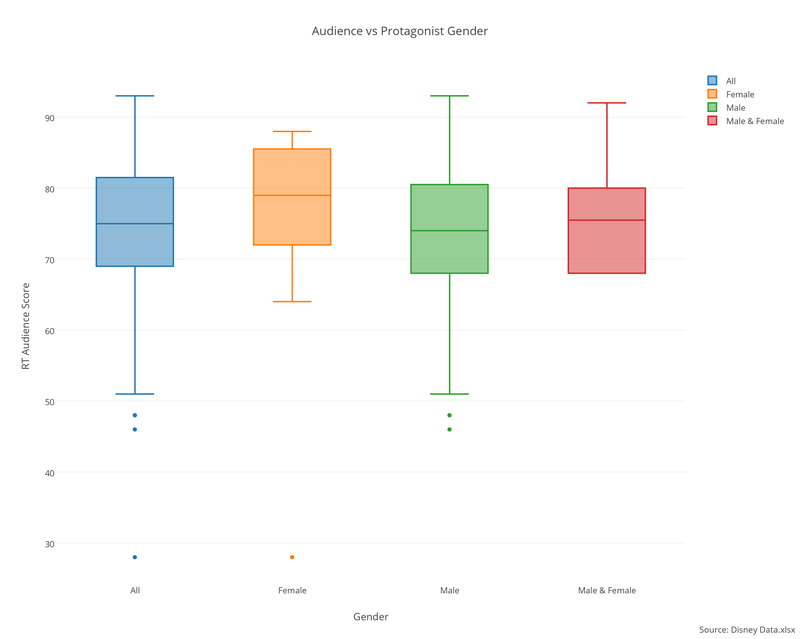 Conclusions: There’s a clear critical preference for movies that have male AND female protagonists, to give access points to all viewers, whereas audience members merely as less likely to think badly of those. 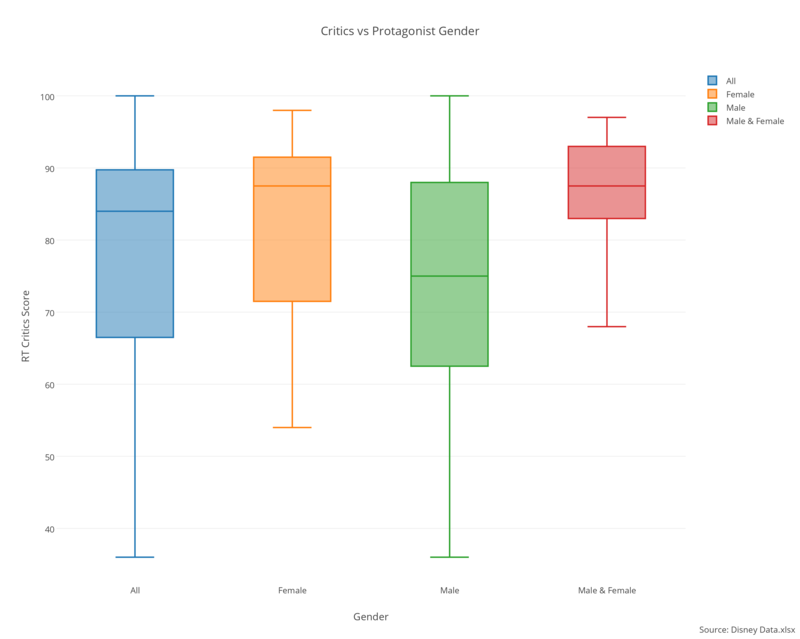 There’s a slight preference for female protagonists among both audience members and critics as well, though it’s very slight. So what could Disney learn from all this? Well, that clearly we want to see a movie with a pair of heroes, male & female, that face off against a female villain and defeat her without killing her. So make that happen, Disney. Part 2 of my Disney Analysis. So I thought about what effect gender might have on things. Let’s take a look. As we can see, despite Disney’s princess movies, Disney animated films are overwhelmingly male (much like most of Hollywood). 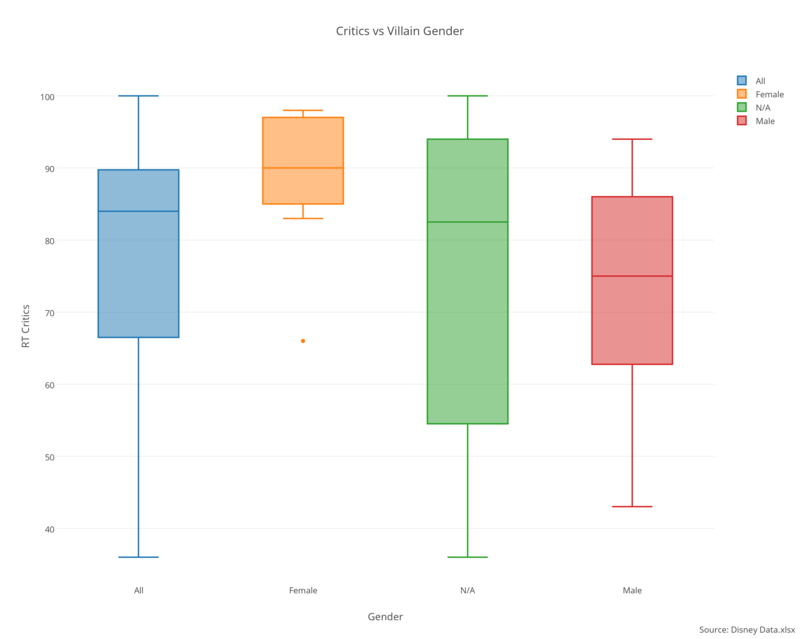 Interestingly, the rates of movies with male villains and male protagonists are the same, about 70%. 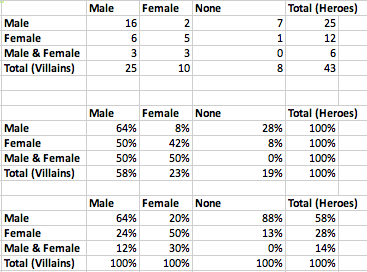 I also looked at how the genders match up – do female villains only face off against female protagonists, for example? 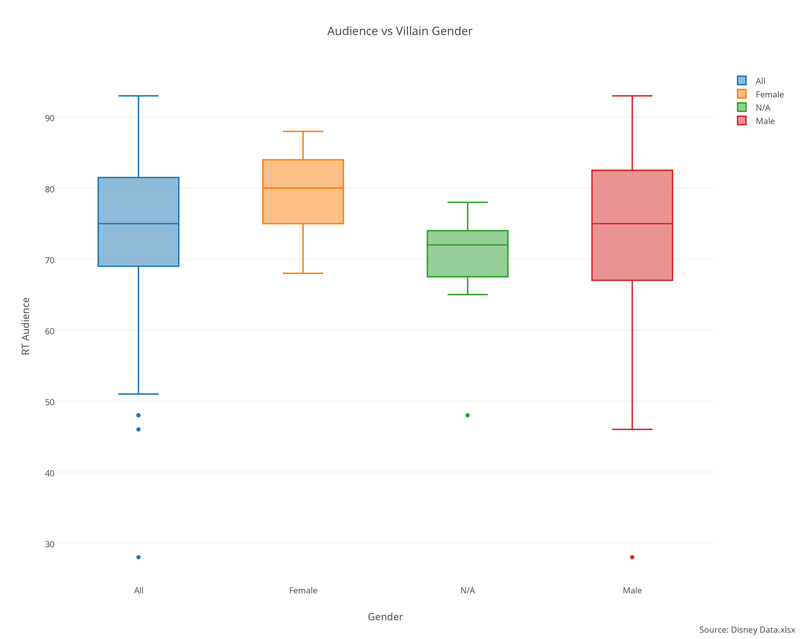 Here we see that there’s no strong associations with male villains – either gender of protagonist can face a male villain. However, there is a strong dissociation of male protagonists to female villains – in fact, there’s only two movies that have male protagonists and a female villain – The Emperor’s New Groove and Meet the Robinsons, both in the current century. (And the “female” in Meet the Robinsons is a robot.) Female villains will also go up against an ensemble of protagonist that includes males, but in general they must go against a female main character. We also see that those man vs self and man vs society movies are literally “man” – only one female protagonist out of the 8. Now, what about my idea that gender affects their fate? First, let’s check the gender of the villain. 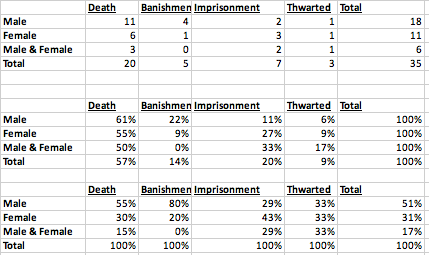 Turns out I was wrong – there’s no association between gender and death (or banishment). 57% of all villains die, while 56% of male villains die and 60% of female villains do. There’s a slight association with male villains being imprisoned while female villains are merely thwarted, but the sample size for those is much smaller. 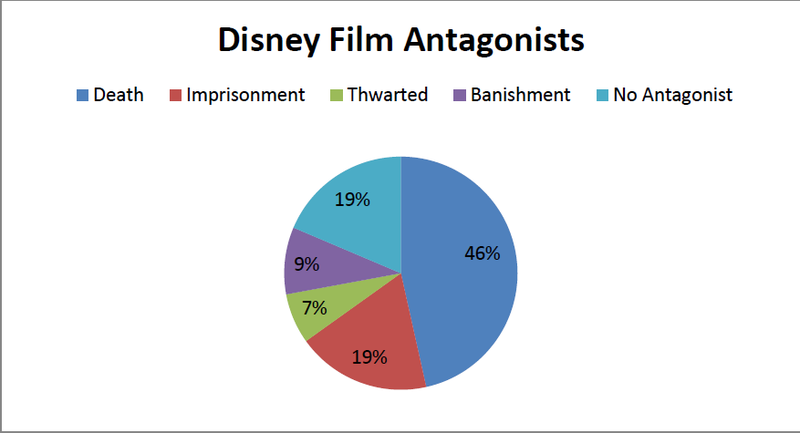 But while the distribution of genders for the villains is lopsided, how they treat those villains is pretty equitable. What about the heroes? Do the male heroes cause all the death? No, not really. The death stats are pretty close to the overall stats. I do see an association with male protagonists banishing their foes while female ones imprison them, though. However, as Elena said above, most Disney deaths are not directly caused by the heroes – they are often accidental or caused by the villain themselves. By my reckoning, there are only 5 villains that are directly killed – Maleficent, Ursula, Scar, Shan Yu, and Captain Rourke. Now, you may think, “Well, James, 3 of those movies have female protagonists and 2 male, so there’s no association, right?” Well, yes…but then, think about who actually deals the killing blow: Prince Philip kills Maleficent, Prince Eric kills Ursula, the Hyenas kill Scar, Mushu kills Shan Yu, and Milo kills Rourke. Yes, even Mulan does not actually land the final killing blow, though she arranges all the circumstances of that death and should be credited with it. That’s right, these two are literally lady killers. Part 1 in a 3-part series of Disney analysis. I was out on Rob’s balcony this morning and my stream of consciousness was something like this: I shouldn’t stand so close to the edge, I might fall, no I won’t, that’s silly, where did this irrational fear of falling come from, maybe it’s all those Disney villains I grew up on, all the villains always fall to their doom, hmm, you know, in Frozen the villain doesn’t die at the end, that seems pretty unusual to me, but is it? 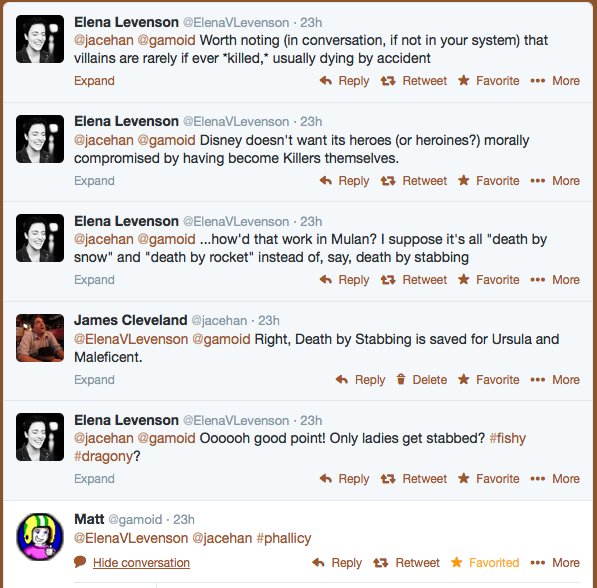 So I decided to do some research and determine just how often Disney villains die. Below are my results, and some other conclusions. I categorized the fates in four ways – death, imprisonment (not always in an actual prison), banishment (or being driven off in some way), and thwarted (where the hero wins but nothing really bad happens to the villain, such as in Cinderella). Another question then arose – has Disney always been this swift with the death penalty, or has that changed over time? 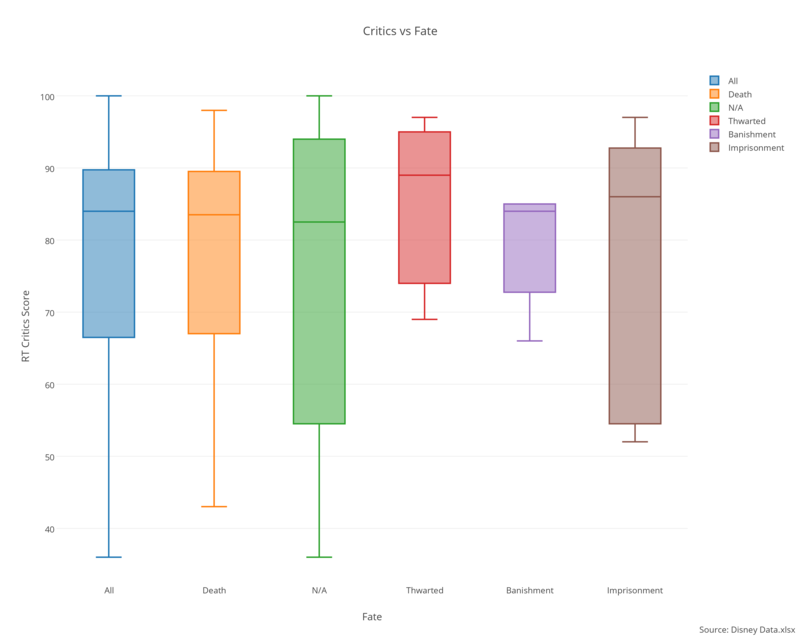 So I made some box plots of the years for the different fates. Though the very first Disney movie, Snow White, has the villain die, it’s a clear outlier – as is Sleeping Beauty. Most of the villain death occur during what is known as the Disney Renaissance, aka my childhood. The time of villains being defeated but without really changing their status quo harks back to an earlier time, whereas banishment and imprisonment as more universal. Interestingly, the films without villains all come from either the 40s or the 2000s. Neither is thought of as a big time for Disney films. Below is my data set (spoilers). Perhaps more analysis will come in the future.